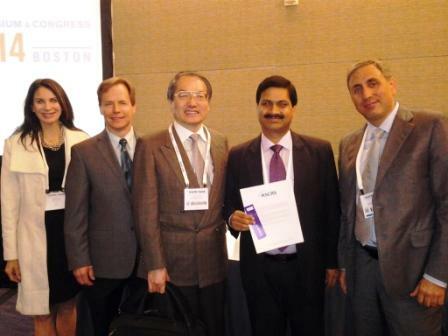 The paper titled 'Notches & Flanges: The Next Pupil Dilating device' by Dr. Suven Bhattacharjee from INDIA, was adjudged the Best Paper of the Session at 2014 ASCRS meeeting at Boston USA. 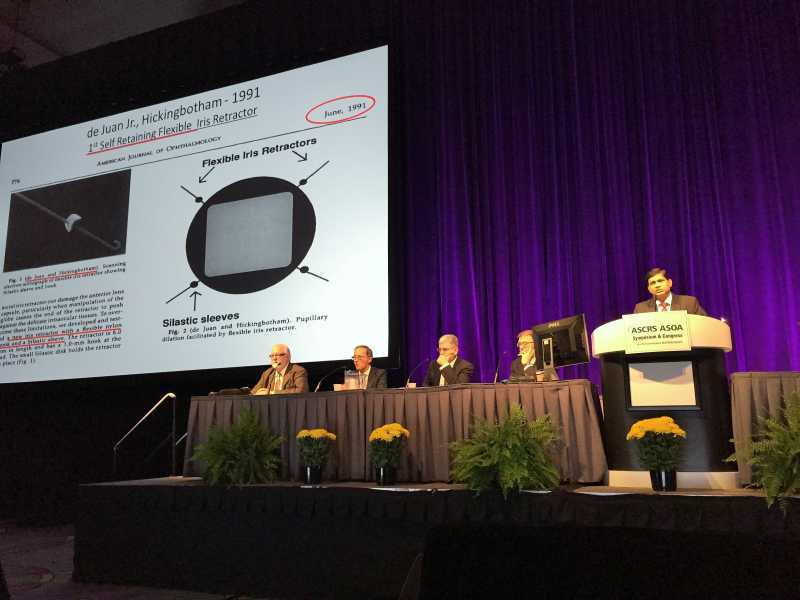 This week’s ASCRS Clinical Spotlight features a presentation by Suven Bhattacharjee, MS, DO titled "IFIS: Intra Operative Floppy Iris Syndrome & Small Pupil." This presentation was a part of the ASCRScourse 21-109: "Phaco Pearls for the Beginner." At the All India Ophthalmological Conference 2014 which concluded on 9th Feb at Agra, Eye Surgeon from Kolkata, Dr. Suven Bhattacharjee bagged the Col. Rangachari award for the best overall paper in Ophthalmology and the Sante Vision award for the best paper in Cataract. 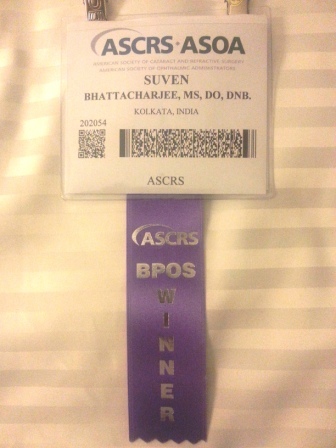 These are the highest awards given by the All India Ophthalmological Society in recognition of research in these fields. The invention ‘Bhattacharjee Ring’ is a new pupil expansion device that can enlarge the pupil during cataract and other eye surgery when it does not dilate with medications. This device is superior to existing devices in requiring much smaller incisions for insertion and removal and its simple design also allows it to be produced by inexpensive methods. This in turn will reduce the cost of cataract surgery in these difficult situations and also save the country thousands & thousands of dollars that are spent in procuring existing pupil expansion devices.This device is likely to gain global acceptance and become the standard of care for cataract surgery in certain difficult situations. Dr. Bhattacharjee has been in practice in Kolkata for 22 years. These awards are all the more special because never has a solo practitioner with limited research facilities (almost none) ever ventured anywhere near these. Dr. Bhattacharjee had competition from some of the best institutes in the country - AIIMS, Sankara Nethralaya, LV Prasad Eye Institute, Aravind Eye Hospitals etc. etc. 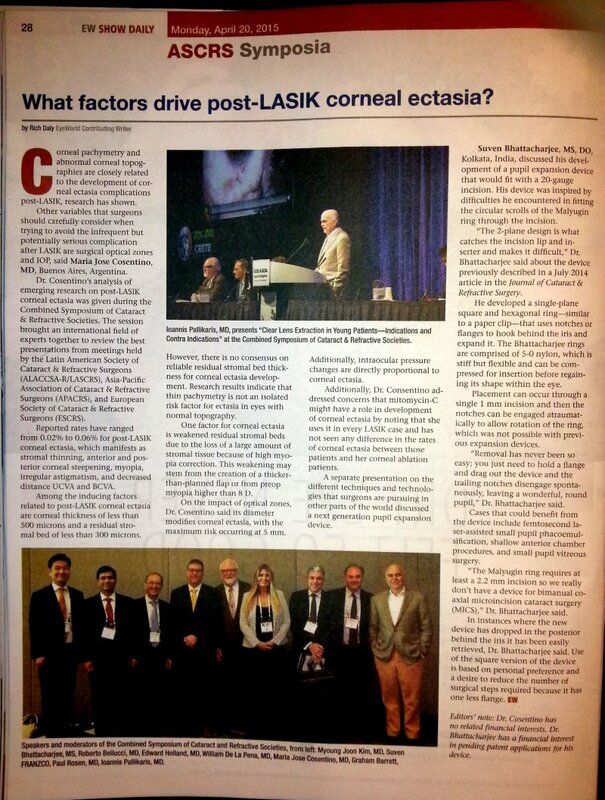 These are Ophthalmology institutes with the best research facilities and dedicated teams & unrestricted funding. Dr. Bhattacharjee had only hard work, family support, midnight oil to burn, limited funds & a modest set up. With India scoring very low on innovation, an invention that might change the way some difficult cataract surgery will be done globally is something to reckon with.